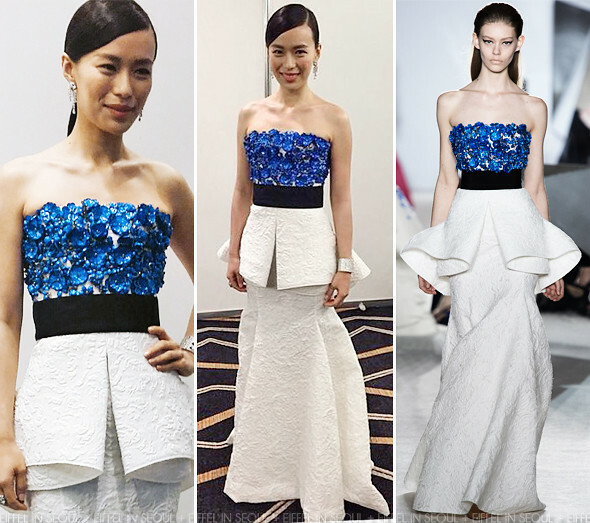 Singaporean actress, Rebecca Lim (林慧玲) attended the 2014 Star Awards show 2 held at Suntec City in Singapore on April 27, 2014. The beautiful actress was dressed in a metallic floral embroidered gown with a lace peplum skirt from Giambattista Valli Spring 2014 Haute Couture collection. Cartier jewels to complete her look. Without a doubt, she was my best dressed that evening. Elegant and poised. Rebecca Lim (林慧玲) bagged the 'Best Supporting Actress' for her role in 'The Dream Makers (志在四方)' as well as the 'Top 10 Most Popular Female Artistes' awards.